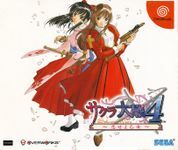 The fourth installment in the Sakura Taisen series. Oogami and the whole repertoire from Paris travel to Tokyo, mingling with the original 8 girls from the first two games. The flower group of the Imperial Bloom Attack Squad and the flower group of the Paris Bloom Attack Squad are all gathered in the imperial capital! The last battle is about to begin.